I am a New Zealand based consulting engineer with experience in all aspects of the power industry. While my main interest is in hydropower, I have experience in wind, solar, tidal and wave power. I have also worked on substations and transmission lines, on diesel, steam and gas turbine stations and I have had some involvement in nuclear power. My academic qualifications include a Masters degree in power system design and I am a Distinguished Fellow of the Institution of Professional Engineers, New Zealand, a Fellow of the Institution of Mechanical Engineers and a retired Fellow of the Institution of Engineering and Technology. I have acted as a consultant on many overseas projects in developing countries. This has included work for the World Bank, the Asian Development Bank and as independent advisor on dam projects in India, West Africa and Afghanistan. I have been married for 50 years and we have a son and a daughter - both are engineers. My recreational interests are sailing, windsurfing, and rowing. I recently won a gold medal at the World Masters Games for winning the single sculls race in the 80+ age group. You can contact me via the form on the following page. 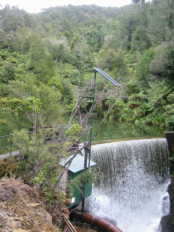 My wife and I are majority owners of a 950 kW 200 m head hydro scheme in Golden Bay in the South Island of New Zealand that I designed and commissioned and now operate by remote control using text messaging. In February 2014 my book "Small Hydroelectric Engineering Practice" was published by CRC Press. The book covers all the steps involved in developing small hydropower schemes from initial identification right through to operation and maintenance. It covers hydro schemes from 500 kW to 50 MW. All the reviews have been positive. There is more information on the page "My Book"
I am very concerned about the the safety of large dams and, in particular, the safety of spillway gates. I believe that many gate lifting systems are not sufficiently reliable and I am doing my best to persuade the designers and operators that more attention needs to be paid to safety and ensuring that gates can operate independently and without an external power supply. Presentations and papers for ICOLD and the British Dam Society covering this can be downloaded from the "Hydropower" page. I am seriously sceptical of claims that global warming is man-made, real and dangerous. 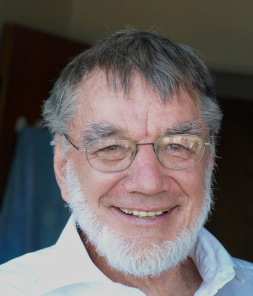 These predictions rely upon computer models that failed to predict that there would be no warming for the last 18 years. This means that they are worthless. The climate is always changing and we must be prepared for climate change – be it warming or cooling. History tells us that cooling is more dangerous than warming. As you can see from my page on "global temperature prediction" we can, to some extent, predict temperatures from records of the Southern Oscillation Index (El Nino effect). I wonder how the global warmers are going to explain this?